A couple of months ago, in the post “The Myth of the Endless Ladder,” I critiqued the widespread assumption that progress in production technology, such as advances in robotics and analytical software, inevitably “frees humans up to work on higher-value tasks,” in the words of economics reporter Annie Lowrey. While such a dynamic has often been true in the past, particularly in the middle years of the last century, there’s no guarantee that it will be true in the future. Evidence is growing, in fact, that a very different dynamic is now playing out, as computers take on more analytical and judgment-making tasks. In place of the endless ladder, we may now have what MIT economics professor and labor-market expert David Autor calls a “downward ramp.” The latest wave of automation technology appears to be “freeing us up” for less-interesting and less-challenging work. After two decades of growth in the demand for occupations high in cognitive tasks, the US economy reversed and experienced a decline in the demand for such skills. 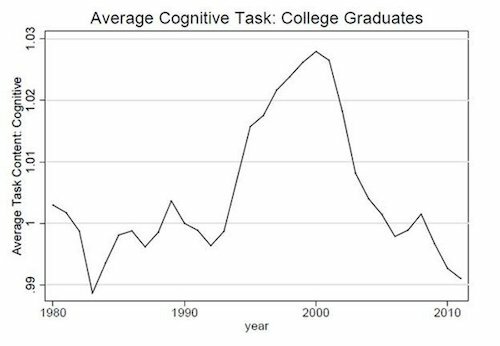 The demand for cognitive tasks was to a large extent the motor of the US labor market prior to 2000. Once this motor reversed, the employment rate in the US economy started to contract. As we have emphasized, while this demand for cognitive tasks directly effects mainly high skilled workers, we have provided evidence that it has indirectly affected lower skill workers by pushing them out of jobs that have been taken up by higher skilled worker displaced from cognitive occupations. This has resulted in high growth in employment in low skilled manual jobs with declining wages in those occupations, and has pushed many low skill individuals out of the labor market. Edsall reports that two other recent studies, one by Andrew Sum et al. and one by Lawrence Mishel et al., also find evidence of the deskilling trend among even the well-educated. This is bad news for several reasons. One of the most important is that the downward ramp appears to be leading to a “skills cascade” in which highly skilled / educated workers take jobs lower down the skill / wage ladder (since there’s not much demand at high levels), which in turn pushes less skilled workers even lower down the ladder, and so on. [Harvard economist] Larry Katz has found that “lots of new college graduates are moving into the service sector, that is, into traditionally non-college jobs, displacing young non-college workers.” Where this all ends is anyone’s guess. At least one thing seems clear: The time has come to challenge not only the assumption that technological advances necessarily push people to higher-skilled work but also the self-serving Silicon Valley ideology that has wrapped itself around that assumption. 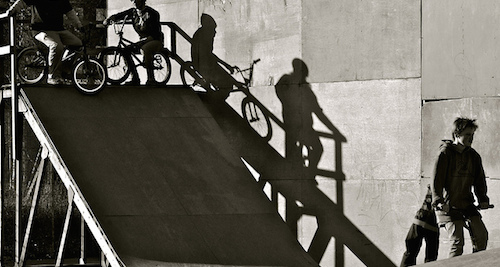 Image: “Guys and Bikes” by Astrid Westvang. This entry was posted in The Glass Cage on June 13, 2014 by Nick. Yes, but … when you challenge it, I hope it’s not just swapping one form of technological determinism for another. That is, not merely saying one older form of technological advancement, the one you grew up with, was positive after all – but now, this newfangled com-put-er stuff, it’s negative. That leaves out extensive policy shifts, with factors such as massive concentration of capital ( aka enormous inequality), which have profound influences on the job market. Seth, that’s just lazy relativism: old and new are neutral and can be swapped at will. The effects of innovation are often not so neutral. We’re gradually designing and engineering a world that is openly hostile to humans bothering to do anything. Replace the meat sacks with ‘bots and ‘puters until there no need for humans at all. It’s dystopia masquerading as utopia. Brutus, I’d call it non-determinism, not relativism. The idea is not “swapped at will”, but statements such as “the effects of innovation” are simply another way of talking about politics. And this shouldn’t be hidden by ignoring the politics – very much a point Morozov keeps making (harshly, but it’s important). It matters that real wage growth in the US has been stagnant for decades, and this happened before computers and the Internet. One can say it’s an intrinsic part of this new tech, and come up with a story along those line – which implies it’s a force of nature somehow. Or one can point to deliberate policy choices about wages and investment. Moreover, these very same arguments were run for farming, for manufacturing, indeed back to the real Luddites. If anything is lazy, it’s storytelling that all those arguments were indeed wrong, but this time for sure. Nick, the problem is “focusing” to the exclusion of all else, so it becomes _de facto_ a deterministic argument by implication and omission. What I mean in regard to the Luddites, is that we don’t have many people arguing today that we should consider whether to use traditional humanistic hand-looms as opposed to the scary soulless textile machines, because of the social values involved (of course, hand-looms strengthen the brain because they develop dexterity and coordination, while manufacturing has been linked to dementia :-)). I actually don’t see the technology side of the issue as being particularly deterministic. The effects of automation technologies on jobs and job skills reflect not just the technology itself but the way the technology is designed and deployed, which in turn reflects individual, commercial, and social decisions. If you’re interested (warning: plug approaching), I discuss this at length in my upcoming book. Also: the range of jobs and job skills that computers can handle is far, far broader than the range that could be handled by industrial machinery, so it’s dangerous to view the former as simply a variation on the latter. It would be a considerable sorting trick to filter technology, economics, and politics in this discussion and arrive at the root cause (or several) of anti-humanist developments. I’ve been considering the question for some time and I can only see the result. I intuit, however, that an answer lies somewhat deeper than the level of conscious policy- and decision-making and, like most shifts in deep culture, may not be entirely or even mostly deterministic in nature. I should point out, too, that anyone who doesn’t enthusiastically board the runaway train we’re on is typically branded, at best, quaint, or at worst, a Luddite (an obvious smear). I caught something of interest in the DVD bonus features of the film Elysium, where the task of designing the space station sets was given to an older fellow whose methods included working with real objects in physical space and with pen, ink, and paper rather than manipulating his materials virtually on a computer screen and drawing with a stylus. The director admitted, perhaps without fully recognizing the import of what he was saying, that the fellow’s mind was shaped and structured differently, which produced results his younger cohorts could only then imitate. The value of such thinking is elusive. Nick, it’s far broader than even “designed and deployed”. It’s more along the lines of, when does productivity gain accrue to capital-owners rather than labor? That’s very much an economics and politics matter. Look, if I phrase it that way, it’s clear you’re hardly going to say “No, politics and economics don’t matter at all”. But an exclusive focus can have that effect. I would say there’s much to be learned by comparing previous debates, and am wary that asserted differences are a smuggled argument for exceptionalism (imagine – “With industrial machinery, manufacturing can be scaled like never before – the individual worker is reduced from a craftsman valued for human talent, to a mere cog in that technological abomination, the _machine_. Our brains are turned into gears and cogs, our souls become as the demon electricity which powers the idol worshiped by the fetishists of mechanization.”). Brutus – pen, ink, paper? How can one ignore the benefits of the mental pauses enforced via dipping goose-quills into collections of ash, or the solidity of clay tablets? Seth, given that, like everyone else, I come into any discussion armed with a postmodern, post-ironic inverter-deflector detector, I honestly can’t tell in this medium whether you’re agreeing or being snide. Interestingly, the downward slope coincides with the great outsourcing of the tech industry. The grand ideas paraded by millionaires of Silicon Valley (or the like) carry little weight with me; their ideas always only serve their business interests. Unfortunately, too many take what they say at face-value. To me, their money or net worth means diddly squat. I don’t consider them more insightful or wise than anyone else. Shallow rivers and men are both loud. I have no illusion it’s a killer argument. Nick does address it at times in various ways – I’m well aware of that, and Socrates opposing writing as the most famous example. Still, I think it’s an important point to make, to at least bring up the way it’s so common, the complaint of This Time It’s Different. Similarly, I think technological productivity gain going to capital vs labor is something often framed as determinism. But that’s pretty clearly false (sigh, as much as that can be said) if you consider applying a similar argument to previous cases which ultimately did not turn out the way the argument would have it.